and successfully transition you to the next level. 90% of all businesses are not adequately equipped to effectively transition. Most private businesses have the ability to double their value over a 3-5 year period, yet many do not intentionally focus on the right activities to achieve these results. 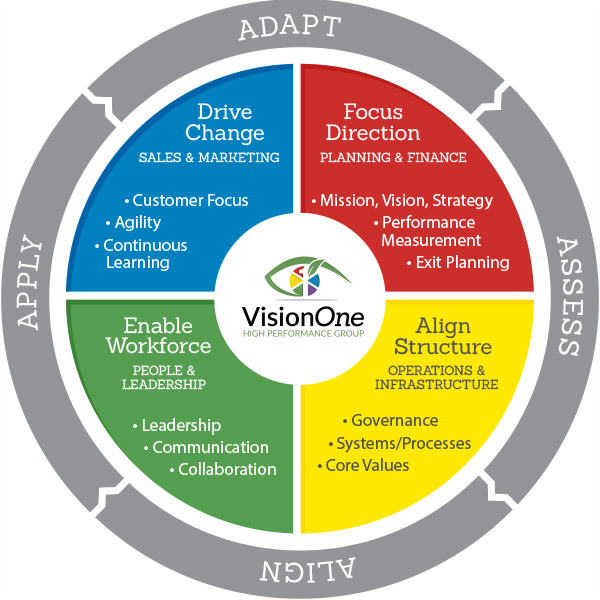 VisionOne has a variety of tools, strategies, and advice to maximize your company’s value and successfully transition you to the next level. Private, mid-market companies wanting to get to the next-level of growth, improve performance, maximize value, and enhance employee engagement. Is your business stuck? Do you need help getting it to the next level of growth? Do you know the market and intrinsic value of your organization and what drives it? Do you have a clearly communicated strategic plan with metrics and a focused direction? Do you have effective leadership, systems and processes, and an aligned culture that supports the market and your goals? Do you have a highly engaged and skilled workforce that effectively deliver results? Does your organization effectively listen to and address the needs of your stakeholders:: shareholders, customers, vendors, partners, workforce and communities? VisionOne was referred by a client to a $6M rural manufacturing company. Leadership was struggling to get the company to the next-level and wanted to implement a new performance review process to drive accountability. After assessing the organizational culture, workforce, and key leaders it was determined that the root cause of the stagnation was a misaligned culture and governance structure, lack of a clear strategic plan and metrics, and lack of next-generation leaders. Worked with the owners to transition leadership to the next generation of family members. Conducted organizational, workforce, and individual key leader assessments. Created a High Performance Leadership Development program for emerging leaders. Implemented and aligned Performance Management System. Assembled a continuous improvement system, strategic communication process, and reward system to foster engagement. The company experienced an immediate increase in employee engagement, workforce involvement, and continuous improvement. The culture transitioned to a more collaborative and innovative environment where employees take more ownership, make more suggestions, and work together to meet the needs of their customers. The owner was able to step out of the day-to-day and focus on spending more time doing what he loves. We can help you to grow and maximize your value.